Is Star Wars Architecture Alien? When you watch a Star Wars movie, the strange alien planets may look hauntingly familiar. The eerie architecture on planets Coruscant, Naboo, Tatooine, and beyond were inspired by historic buildings you can find right here on planet Earth. "I'm basically a Victorian person," director George Lucas told a New York Times interviewer back in 1999. 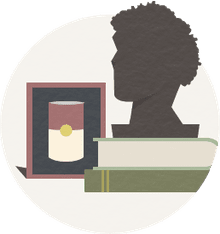 "I love Victorian artifacts. I love to collect art. I love sculpture. I love all kinds of old things." 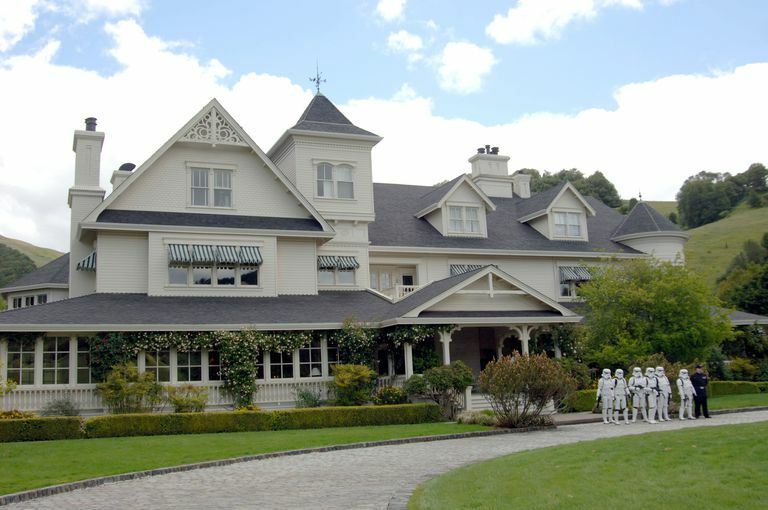 In fact, George Lucas's own home at Skywalker Ranch has an old fashioned flavor: The 1860s homestead is a sprawling building with peaks and dormers, rows of chimneys, etched glass windows, and rambling rooms filled with electronic gadgetry. George Lucas's life, like his films, are both futuristic and nostalgic. As you seek out the early Star Wars movies, watch for these familiar landmarks. The lover of architecture will recognize that film locations are fantasies — and often the design ideas behind the digital composites used today. The small, sparsely populated planet Naboo has romantic cities built by advanced civilizations. In choosing film locations, director George Lucas was influenced by the architecture of Frank Lloyd Wright's Marin County Civic Center, a sprawling, modern structure near Lucas' Skywalker Ranch. Exterior scenes of the City of Theed, the capital of Naboo, were more classical and exotic. In Star Wars Episode II, Plaza de España in Seville, Spain was the chosen location for the City of Theed. The beautiful Spanish Square is really a semicircle in design, open to the air with fountains, a canal, and an elegant colonnade that was showcased in the movie. Spanish architect Anibal González designed the area for the 1929 World Exhibition in Seville, so the architecture is traditional revival. The film's palace location is much older and not even in Seville. The vast complex of Theed Palace with its green domed buildings is both classic and baroque. We might be seeing a dream-like version of an old European village. And, indeed, interior scenes of Theed Royal Palace in Episodes I and II were filmed in a real life 18th century Italian palace — the Royal Palace in Caserta, near Naples, Italy. Built by Charles III, the Royal Palace is sumptuous and romantic with arching doorways, Ionic columns, and gleaming marble corridors. Although smaller in scale, the palace has been compared to the great royal residence in France, the Palace at Versailles. Villa del Balbianello was used as the location for wedding of the fictional characters Anakin and Padmé in Star Wars Episode II. Directly on Lake Como in northern Italy, this 18th century Villa creates a sense of magic and tradition on the Planet Naboo. At first glance, the densely populated planet, Coruscant, appears wildly futuristic. Coruscant is an unending, multileveled megalopolis where skyscrapers extend to the lower fringes of the atmosphere. But this is no Mies van de Rohe version of modernism. Director George Lucas wanted this Star Wars city to combine sleek lines of Art Deco buildings or Art Moderne architecture with older styles and more pyramidal shapes. Coruscant buildings were filmed entirely at Elstree Studios near London, but look closely at the towering Jedi Temple. The art department experimented with various designs, striving for textures and shapes which would suggest the religious nature of this great structure. The result: a massive stone building with with five towering obelisks. The obelisks resemble rockets, yet they are tipped with pseudo-Gothic ornamentation. Jedi's Temple appears to be a distant cousin of a European cathedral, perhaps like the interesting architecture in Vienna, Austria. "I've found that you should avoid making things up without anchoring them to a strong foundation based in world history," chief artist Doug Chiang told reporters after the release of Star Wars Episode I. If you've ever traveled through the American Southwest or the African plains, you know the desert planet of Tatooine. Lacking in natural resources, settlers in George Lucas's fictional planet built their villages piece by piece over many years. Curved, earthen structures resemble adobe pueblos and African earth dwellings. In fact, much of what we see in Tatooine was filmed in Tunisia, on the northern shore of Africa. The multi-layered slave quarters in Star Wars Episode I were filmed at the Hotel Ksar Hadada, a few miles northwest of Tataouine. Anakin Skywalker's childhood home is a humble dwelling within this slave complex. Like the Lars family homestead, it combines primitive construction with high technology. The bedroom and kitchen are cave-like spaces with ragged windows and storage nooks. Ghorfas, like the structure shown here, originally stored grain. The Lars family homestead from Star Wars Episode IV was filmed in the Hotel Sidi Driss in the mountain town of Matmata, Tunisia. The pit house or pit dwelling could be considered one of the first "green architecture" designs. Built inside the earth to protect its inhabitants from the harsh environment, these earthen structures provide both an ancient and futuristic aspect of building. Many scenes from Star Wars: The Phantom Menace were filmed at Ksar Ouled Soltane, a fortified granary near Tataouine in Tunisia. Like the primitive locations in Tunisia, Yavin IV is portrayed by the ancient jungles and primeval monuments found in Tikal, Guatemala. George Lucas created Star Wars, but he has not directed every movie. Episode VIII was directed by Rian Craig Johnson, who was 3 years old when the first Star Wars movie came out. The process for selecting movie locations has remained the same — design from reality to create fantasy. In Episode VIII, Dubrovnik in Croatia was the model for the casino city of Canto Bight on the Planet Cantonica. Attention to details, including architectural details, has made George Lucas and his Lucasfilm company a success. And where does Lucas and his winning team go next? Disney World. The best next world on Earth is owned and operated by the Walt Disney Company, who bought Lucasfilms in 2012. Immediately, Lucasfilms and Disney made plans to incorporate the Star Wars franchise into both of Disney's theme parks. A brand new world is being planned, never before seen in any Star Wars episode. What will it look like? Director George Lucas is steeped in earthly delights. Water, mountains, deserts, jungles — all the environment of planet Earth — make their way into galaxies far, far away. Expect more of the same in Florda and California, with every dimension to be explored. Should Star Wars Be Watched in Chronological Order or the Order of Release?